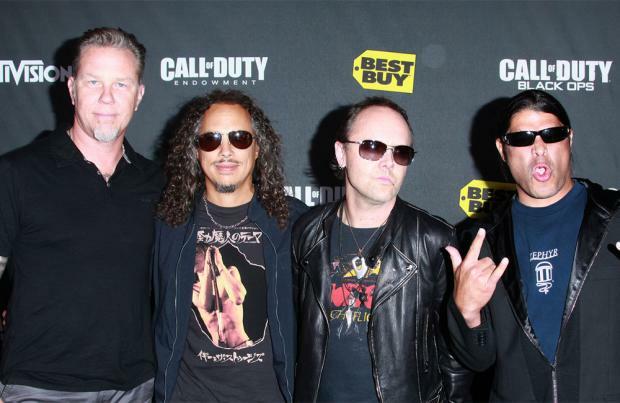 Metallica will release 27 different live albums before the end of the year. The 'Enter Sandman' rockers will mark the 10th anniversary of their LiveMetallica.com site by offering CDs and LPs of every one of their 2014 gigs, mostly comprising their fan-voted 'Metallica by Request' shows from South America and Europe. Every Monday until the end of the year, the group will release three albums in the order they played the shows, beginning with Bogotá, Colombia. Additionally, fans can also purchase a special box set of all 27 shows, which will be sold on the website and dispatched in December. Fans are being asked to vote for their favourite of the 'Metallica by Request' shows and the four most popular will be made available on limited-edition, 180-gram vinyl releases early next year. The 'Nothing Else Matters' rockers - who are currently working on a new album - recently set a Guinness World Record for being the first band to play all seven continents in one year. "Yes, 120 scientists and competition winners. Not to mention the 300 very curious penguins!"